Russell Dornan had been waiting for years to visit the Museum für Naturkunde, having spent most of his childhood near Köln, but never making it to the German capital. As soon as he started his traineeship (to become a natural history curator) he set his sights on Berlin’s Natural History Museum, arranging a week of work experience across the institution’s collections. 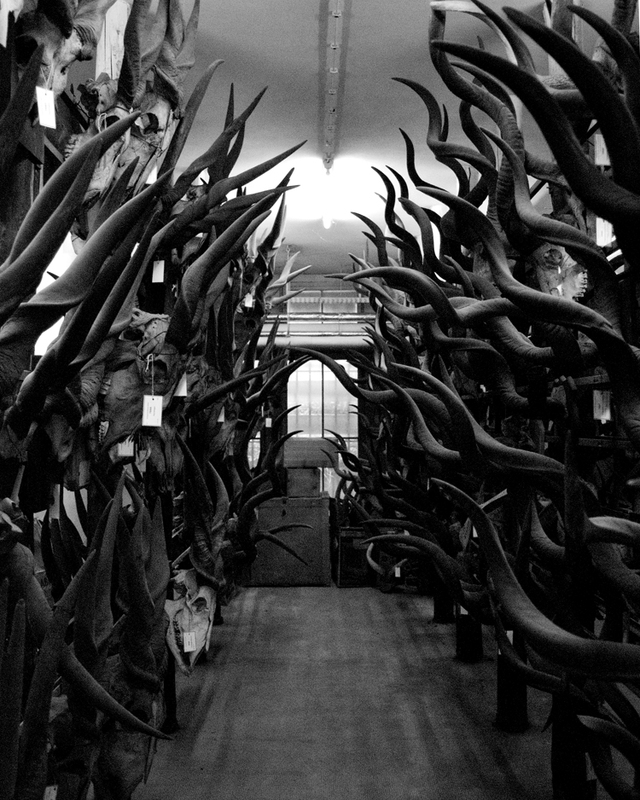 Here’s what he found when he peeked behind the scenes of the Museum für Naturkunde; all images his own. 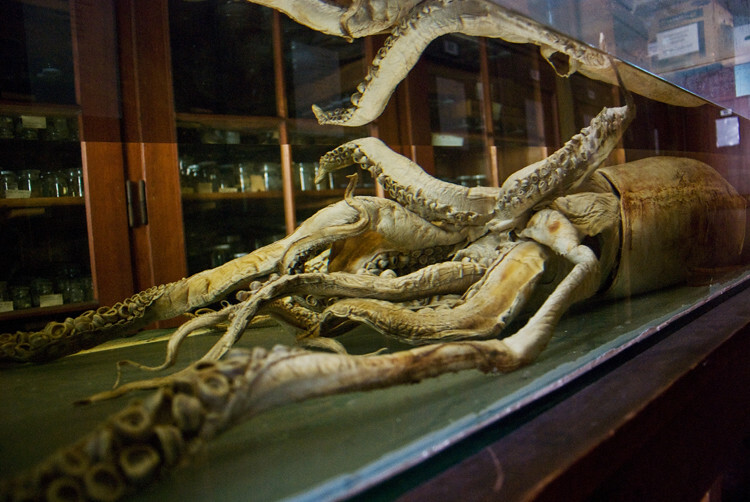 A giant squid preserved in alcohol. My first day was spent with a taxidermist, part of a team who dedicate their time to skinning birds and mammals, cleaning their bones and mounting them ready for either exhibition or to be stored as part of the scientific collection. They have won many awards throughout Germany and Europe, and rightly so; I’ve never seen taxidermy like it. I love red foxes. After skinning, its bones would have been cleaned and dried and then mounted with the skin, or kept in the scientific collection. Some of the team were skinning a red fox as I arrived. It was a little bit startling to pop my head round a door to find one of my favourite animals having its skin removed; it was also fascinating. 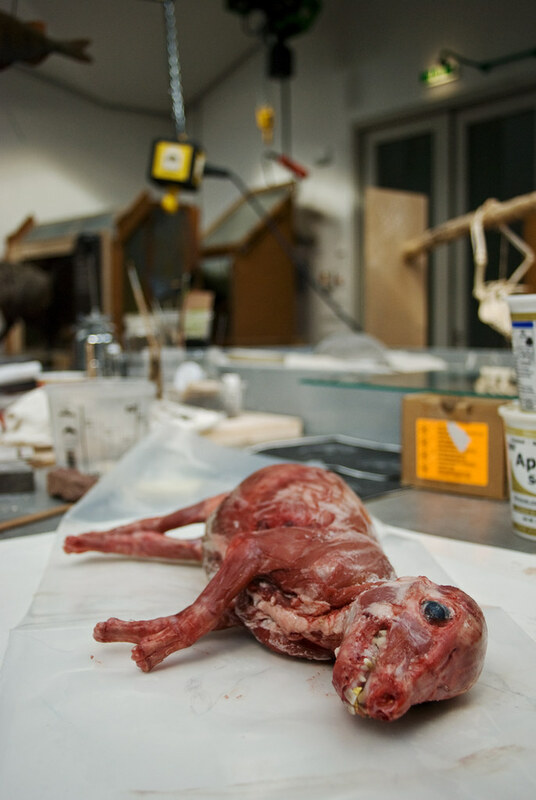 From there I was led through the purpose-built facilities for taxidermy, equipped for every stage of the process. As a result, the pieces they produce (usually from road kill or deceased animals regularly donated to the museum from one of Berlin’s two zoos) are uncannily life-like. I was then shown the bird wet collection: pickled birds in jars. This piglet was freshly skinned and being prepared for use in a display. A Sunbittern preserved in alcohol. Next, the collections manager for ornithology showed me around the largest bird collection in Germany (around 200,000 specimens). He told me of a journal they had found with previously unknown information about some important specimens, filling in some missing geographical data, and adding even more scientific value to the birds. These are some of the scientifically important birds that had to be matched up to the citations in the journal that was found. Due to the number of objects, all museums have a large documentation backlog but Berlin’s was particularly interesting. 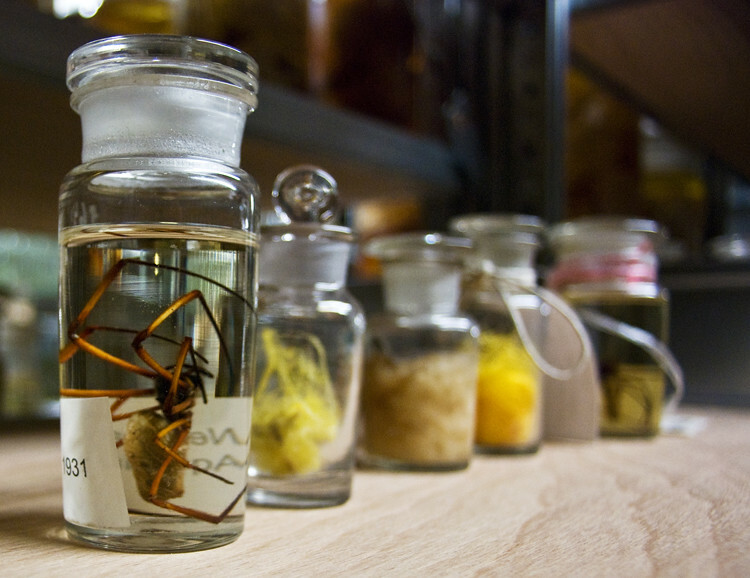 Because of the damage the museum sustained during the Second World War, many specimens are in a poor condition, often with information missing which has to be reconciled. 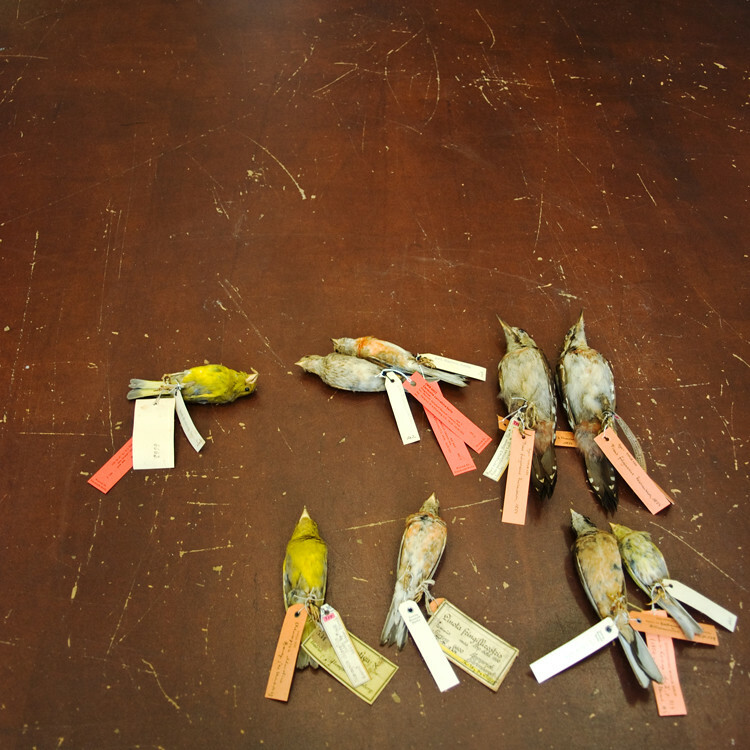 Even missing specimens are input onto the database because they are a testament to what was destroyed during the war. I think it’s a tragic echo; even something as simultaneously trivial and important as a stuffed bird was unable to escape. The museum had undergone a substantial rebuild in 2010 and most departments were still in the process of relocating the material. The East wing was completely razed during the war; it was finally rebuilt and now houses the very large spirit collections. Other specimens were removed and, ideally, cleaned/conserved and packed in new storage boxes with new labels, ready for their new location. My time with the arachnid and myriapod collection team was brilliant. 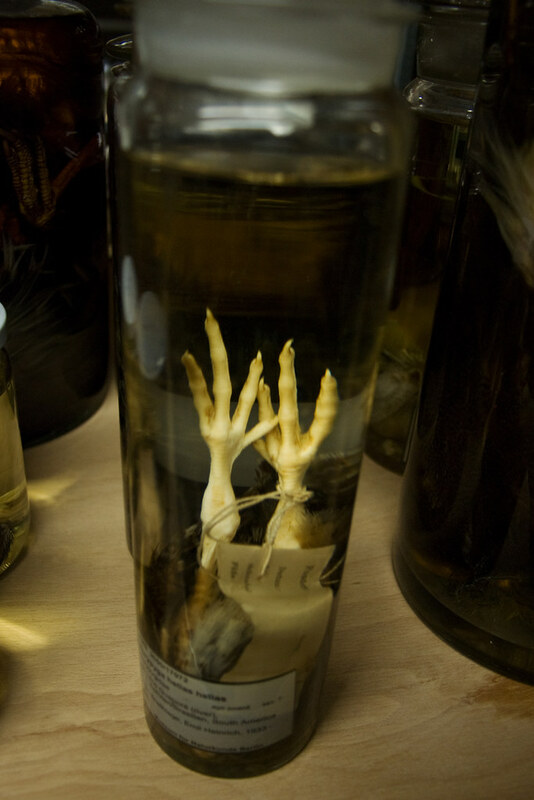 Arachnids tend to be fleshier than insects so lend themselves to being preserved in alcohol rather than pinned. There were still some beautiful examples of pinned spiders, as well as some centipedes and millipedes. In German, these are known as “Tausendfüsser” (literally: “thousand feet”). 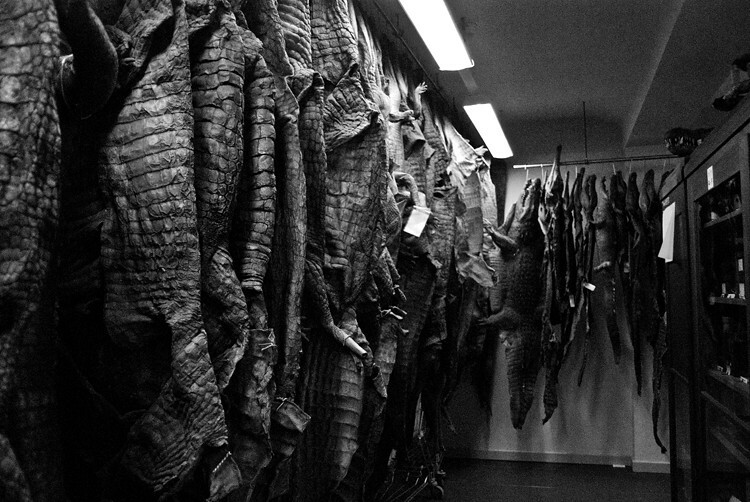 The reptile skins are kept in the same area; it was like a crocodile’s walk-in wardrobe. This was followed by a visit to the fish collection, the only one of four floors of spirit collections, across the departments, that is among the public galleries. While manageable, this isn’t practical; it forces the team to adopt unorthodox methods and to organise themselves in a slightly different way than if the collection was behind closed doors. The bright yellow web is like thread: it’s soft, super-strong and vivid. Some people have extracted it and woven it into things like shawls. The mammal section was one of my favourites. When a mammal comes into the museum it gets preserved as a combination of: a skull, a skeleton, a skin or a whole animal. They are usually all kept separate. Sometimes only the skin or skull are kept; sometimes all of it, in which case the individual parts are stored in the relevant areas. 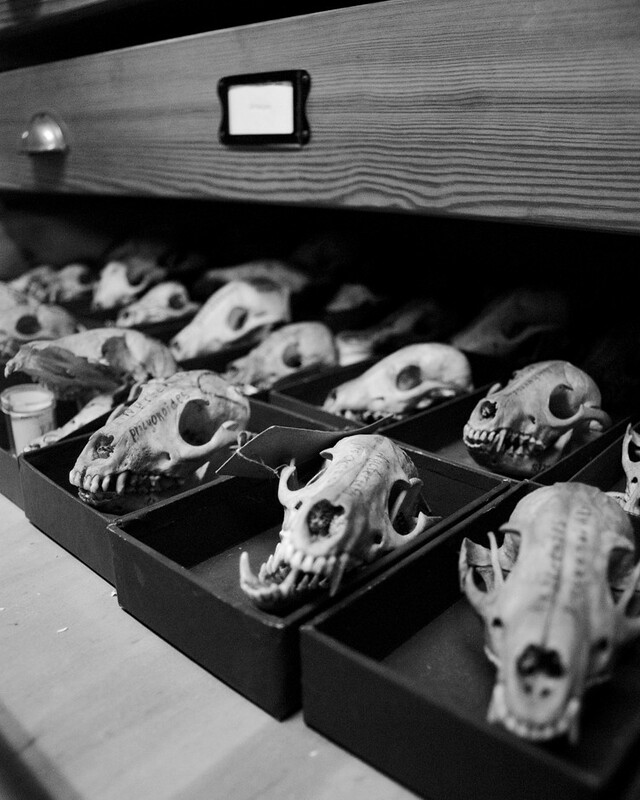 A drawer of fox skulls. They are kept in the little boxes so they don’t rattle around and get damaged, and so that if anything breaks off, theoretically the pieces fall into the box and stay with the main body of the object. 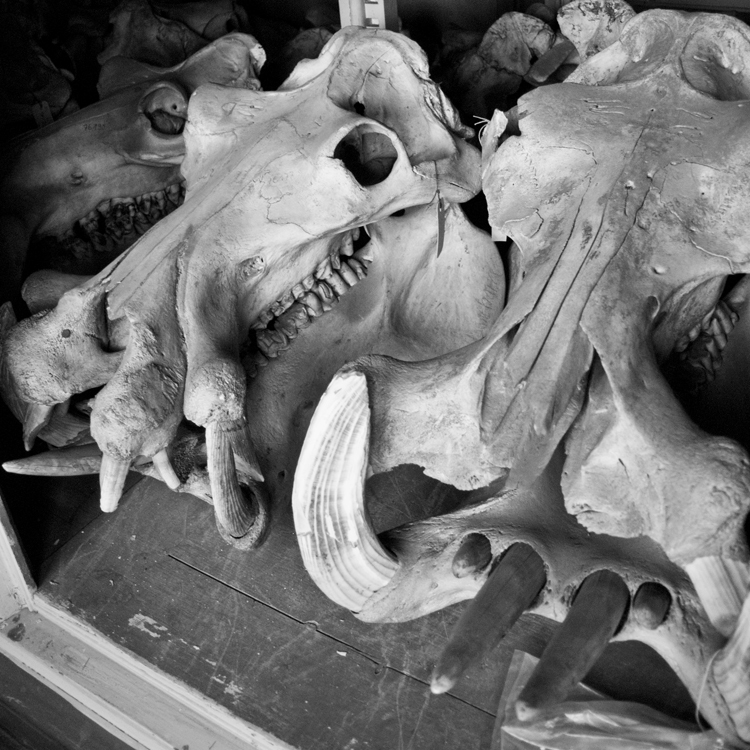 Some of the biggest skulls in the collection are the hippo skulls. There are a lot of them too. After we had looked at the skulls we saw the skin collection. 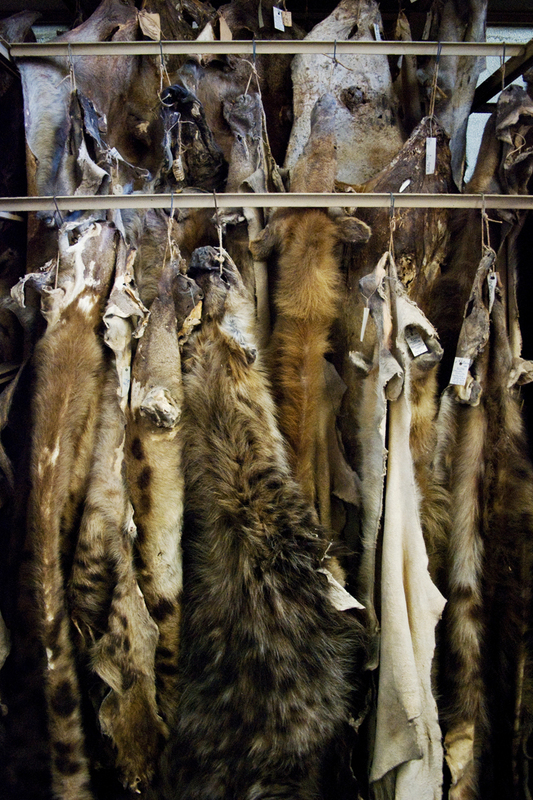 Like the crocodile wardrobe, seeing so many hides of the same type of animal hanging together was surreal. Loads of skins, and other specimens, are needed to make sure that the variation seen in nature is represented in the collection. For example, there are a lot of monkeys. 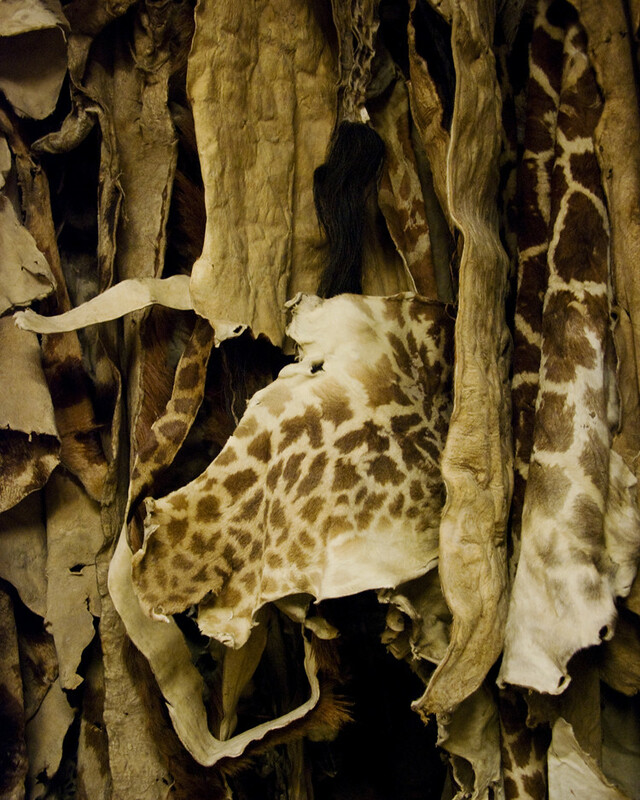 The only way to really store skins from larger animals is to hang them up. Folding them won’t work because most skins get harder as time goes by and then snap and break when anyone tries to lay them flat. Stacking them on top of each other isn’t very logical either. Of course, hanging them isn’t without its problems. They are heavy and the string deteriorates and snaps, meaning there are loads lying in heaps. It’s always a compromise. Unlike dog skins, like the hyena seen here, cat skins don’t go as hard as others. They remain, for the large part, soft and supple. One of the previous curators had a soft spot for primates and Berlin has a very good collection as result. 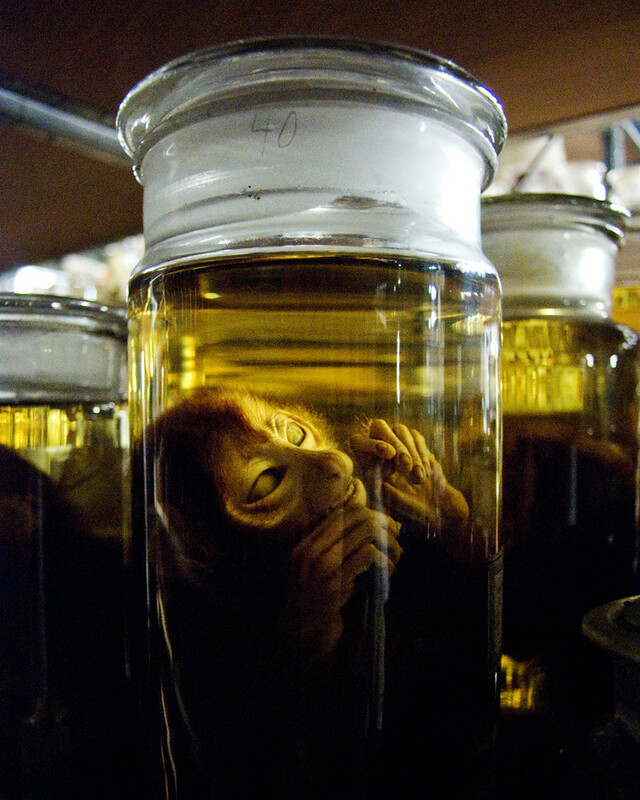 The eerie, human-like quality of the monkeys is a little bit haunting when they’re pickled. I loved visiting the Museum für Naturkunde in Berlin; seeing what they have behind closed doors was fascinating and exciting. You can read more about my time there in my daily blog posts during my visit, and see photos of the public collections on überlin – close-ups of butterflies and beetles, and the weird and wonderful wet collection. Heavier objects are stored in the basement. You have to be careful walking through that.